Mad Butchers Meat was the first stop. This Industrial Cave of Meat was located on the outskirts of Sacramento. There was not to many businesses around this Cavern of prepared protein. They did smoke some sausage and this was procured. 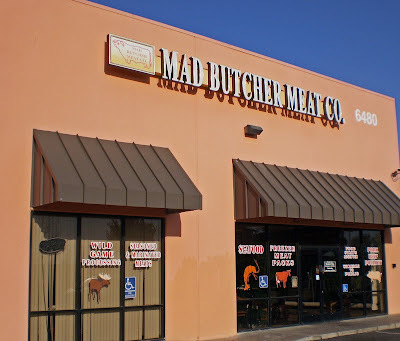 Mad Mead Butchers had a lot of Asians working at their facility. They sold a lot of package deals of meat. 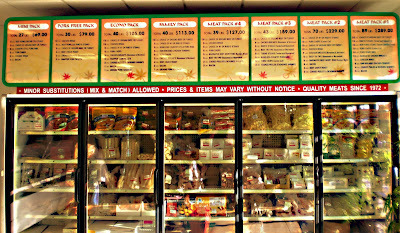 The clerk was very nice and told me they sold lots of meat deals. This would be a great place to pick up a freezer full of beef. On to Jackson California. This leg of the trip was around 45 minutes. It was a scenic drive that passed through Sloughouse Ca. They grow a lot corn and at one time grew hops. Jackson Ca. is in the Heart of the Motherlode. That means Gold. Some of the richest Gold mines in Ca. were located here. Now they have some of the best smoked bacon, hams and sausage around. Lots of antique shops and even a ravioli factory are here. I was on a Mission. A Meat Adventure mission. Swingle's was my destination. 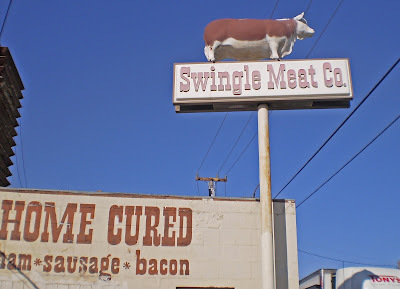 Swingle's has been around for a long time. This is a one stop Meat Emporium. If they do not have it, You have been watching Bizarre Foods to much. They smoke bacon, hams and sausage. 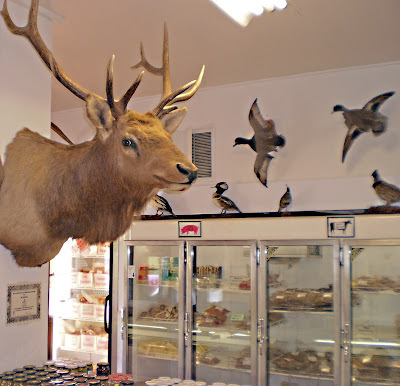 They process game, livestock and have a lot of animals on the wall. Some bacon wrapped chipotle sausage, Jalapeno cheese sausage, bacon and smoked ham was bought and arranged in the ice chest. I would just like to mention their was a Giant revolving Cow that was situated above this Establishment. 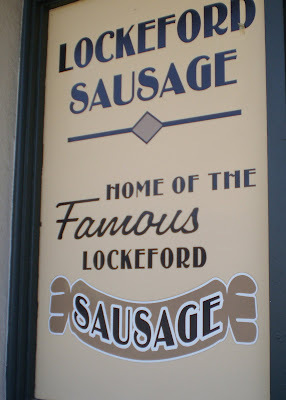 Lockford California is the home of Lockford Sausage. This is a local favorite. When I say local, I mean all up and down the state. 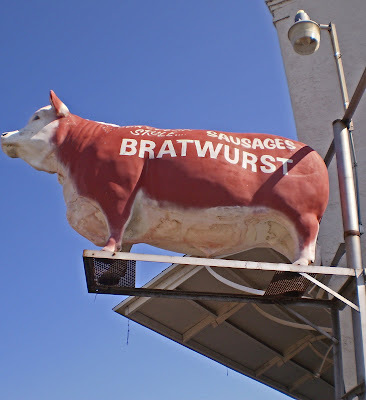 It is a local favorite,because , this is the only place to get this sausage that I know of. My favorite is 'Dakota'. 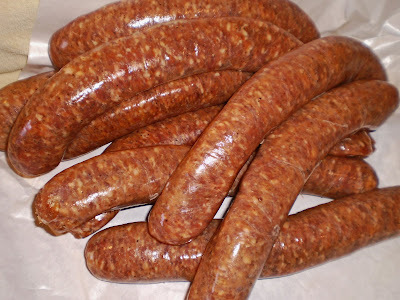 This sausage is a mild combination of veal pork and turkey.I bought 20 dollars worth. It probably will not last long, because it is Ms. Goofy's favorite too. Lodi California. Do you want to be stuck again? (Creedence Clearwater Revival) You may be if you are at 'Lakewood Meats". 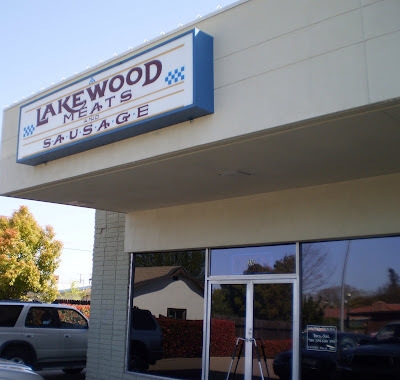 Lakewood Meats is in very nondescript small strip mall in Lodi. The windows are even tinted to make this 'Last House' of 'Sausage Lore' a little more mysterious. Once you walk in, this a meat house of Love. 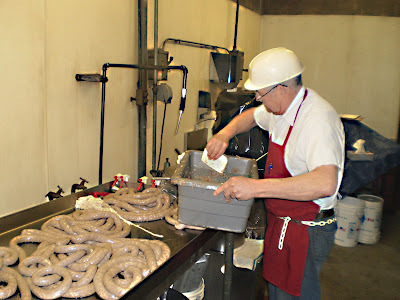 This is an 'Old School' of sausage making. I was greeted by very friendly employees. They got a chuckle of me taking a picture of the front. All of a sudden I had the privilege to travel to the back of this sausage factory. 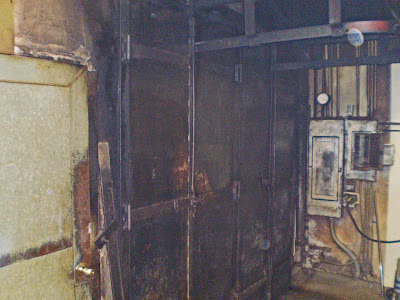 I met the sausage maker and saw the scary smoker room. This is what Meat Adventure's are all about.!!!! We have an Ice Chest of Meat. The next adventures are what to Cook with all this Goodness! Got any Meatsuggestions? I'd say you hit the motherload! I have a feeling your grill is going to be bathed in meaty goodness, have fun! Can't wait to hear all the fun you have with this treasure!